I could not return from my visit to Cyprus without an algal sample and a fine opportunity presented itself early last week when we visited the Avgás Gorge, on the Akámas peninsula at the west coast of Cyprus, just north of Pathos. This is a spectacular limestone ravine whose steep sides offered welcome relief from the Mediterranean sun. 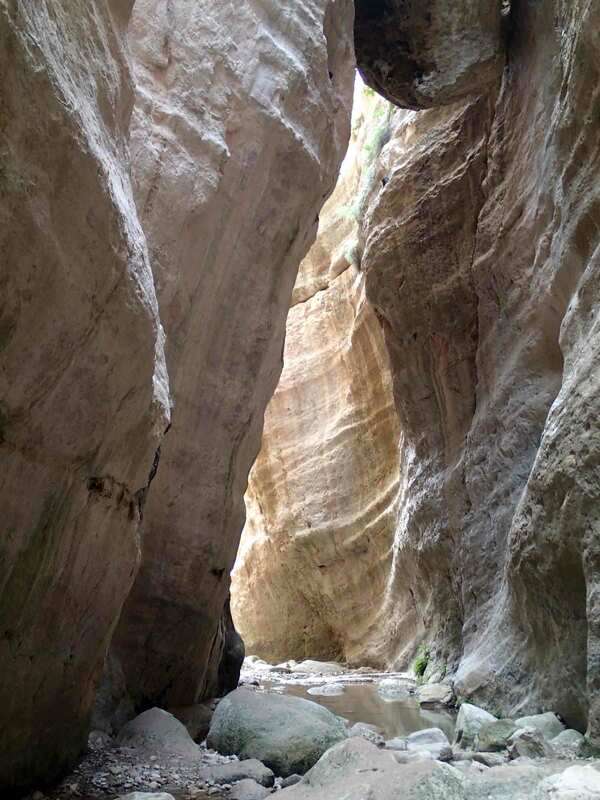 At points, as in the photograph above, the ravine narrowed to just a few metres wide, reminiscent of the siq which guards the entrance to Petra except that instead of exquisite carvings we stumbled across a Russian team conducting a glamour shoot. A small stream made its way down the gorge. The presence of woody debris at intervals suggested a considerable head of water during the winter months but, at this time of year the water has reduced in power, tumbling across a series of boulders into stagnant pools, interspersed with short runs shaded either by the high cliffs or the vegetation that flourished away from the harsh glare of the sun. In the sections where water was still running there were clumps of Chara tangled up with filamentous algae, with plenty of bubbles of oxygen as evidence that both were busily photosynthesising away. 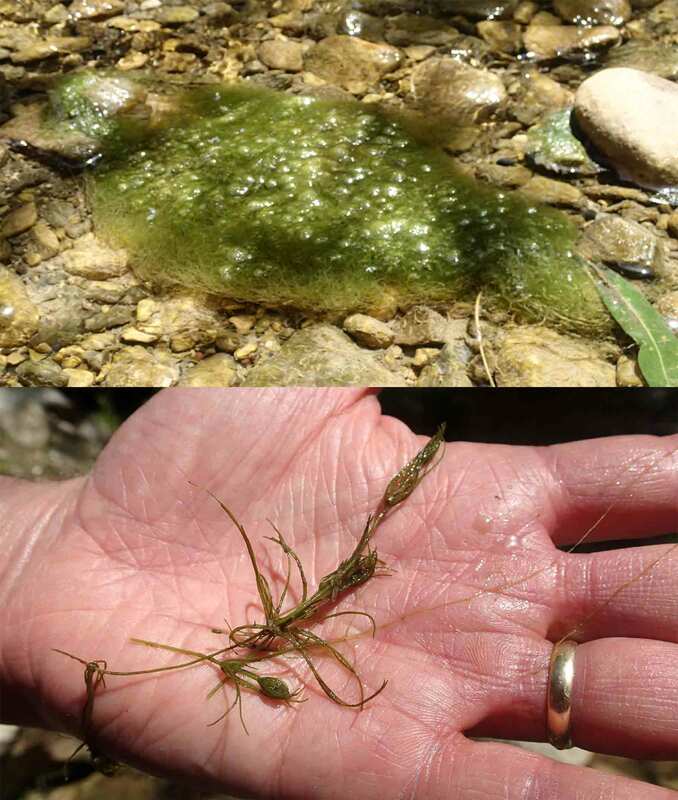 The filamentous algae was a coarse unbranched filament that was clearly a relative of Cladophora but which did not match any of the genera or species that I had encountered before (see “Fieldwork at Flatford” for similar situation). There were pebbles and cobbles between these clumps, their surfaces criss-crossed by the galleries of caseless caddis larvae – probably Psychomyiidae, according to Richard Chadd. Chara growing in the stream at Avgás Gorge in western Cyprus, April 2018. Cladophora or a relative growing in the stream at Avgás Gorge in western Cyprus, April 2018. The scale bar is 50 micrometres (= 1/20th of a millimetre). 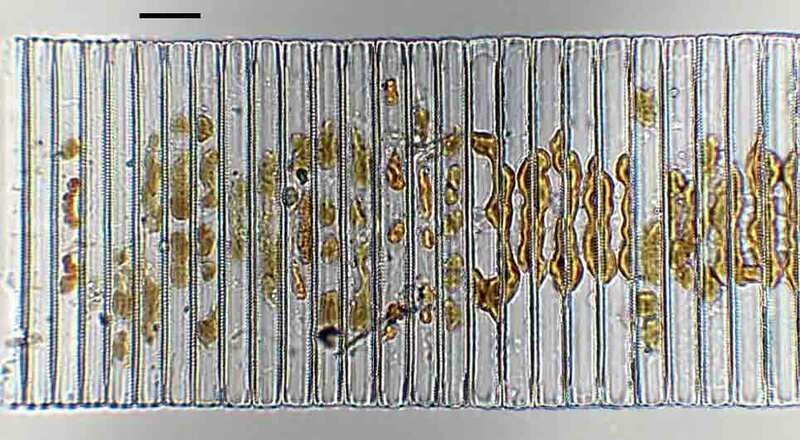 There were a number of diatoms present too, the most abundant of which was a chain-forming Ulnaria. Unfortunately, despite having just co-authored a paper on Ulnaria from Cyprus, I cannot name the species, as I saw no cells in valve view. I will have to return to this subject once I have prepared a permanent slide from the sample that I brought back. The chloroplasts in the illustration below are not in a very healthy state because the sample lived in a fridge for almost a week before I was able to get it under a microscope. Had I looked at this sample 20 years ago, I would have assumed that I was looking at a species of Fragilaria, as most keys then stated categorically that Synedra (the former generic name) were solitary rather than chain-forming. However, we now know that there are several Ulnaria species that form chains although most that I see in my regular haunts in the UK do not. Our paper states that the species we describe form short chains although, as we worked from cleaned samples collected by other people, I now wonder if that was an artefact of the preparation process and whether these, too, formed longer chains in their living state. A chain of Ulnaria from the stream at Avgás Gorge in western Cyprus, April 2018. Scale bar: 20 micrometres (= 1/50th of a millimetre). Though it is rare for me to stray into describing the invertebrate life of streams, the Psychomyiidae are actually an important part of the story here, as the larvae graze algae from the surface of the stones. They create a silk tube and this, in turn, becomes covered with fine sediment to create the galleries that are visible in the picture. We know that invertebrates can change the composition of the attached algae by grazing but I sometimes wonder if the caseless caddis larvae also change the composition by creating myriad patches of very fine sediment across the rock surface. If you look closely you can also see a couple of Simuliidae (blackfly) larvae. These attach themselves to the rock by a circle of hooks at their last abdominal segment (I think that is “bum” in entomological language) and then use fan-like structures around their mouths to filter tiny particles from the water. However, I have also seen Simuliidae larvae bent double on rock surfaces in order to hoover up particulate matter and algae that live there. That, I thought, was just about enough natural history for one day. I put my toothbrush and bottle back into my rucksack and made my way back down until, turning the corner, I stumbled across the Russian glamour models. I’ve often written about the similarities between freshwater ecosystems in different parts of Europe but you don’t often see a bikini – or less – in April in my cold, damp corner. 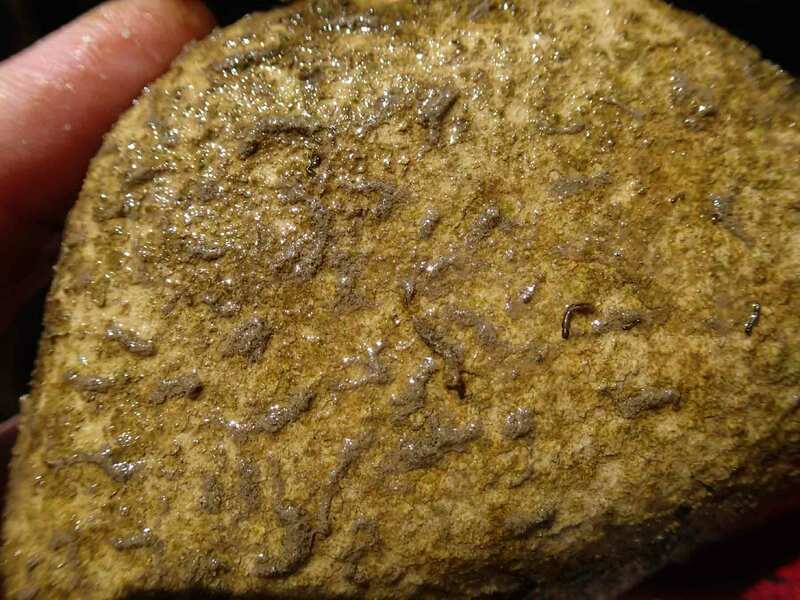 Galleries of Psychomyiidae larvae on the top of a limestone cobble from the stream at Avgás Gorge in western Cyprus, April 2018. Cantonati, M., Lange-Bertalot, H., Kelly, M.G. & Angeli, N. (2018). Taxonomic and ecological characterization of two Ulnaria species (Bacillariophyta) from streams in Cyprus. Phytotaxa 346: 78-92. Wallace, I. (2003). The Beginner’s Guide to Caddis (order Trichoptera). Bulletin of the Amateur Entomologists’ Society 62: 15-26. This entry was posted in diatoms, travel, Uncategorized and tagged algae, Avgas gorge, caddis larvae, Cyprus, diatoms, ecology. Bookmark the permalink. Fragilaria ungeriana Grunow was originally describe from Cyprus. It is now U. ungeriana. I have Grunow’s type material, another unfinished project.It’s on my list. I suspect this is what you have, U. ungeriana, in the pic. But I do not know of any chain-formers in the UK either.